Gardening is great fun but cleaning up afterwards can be a pain. Rolling up your garden hose is one of those jobs that seems to take forever and can be messy. 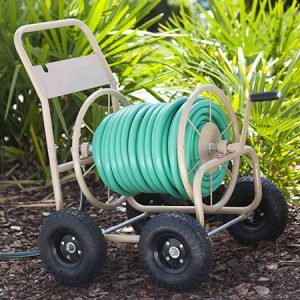 Walking around your garden and picking up a wet tool by hand is no fun so you might be looking for the best garden hose reels. How many times have you had a tiring day in the garden and just wanted to pack up and tidy everything away as quick as you can? Or when you’ve wound up your hose by hand then found cracks or splits in it the next time you go to use it because it has just been stored on the ground? Using a reel can make sure your hose is easy to put away and it is stored properly so it will last longer and won’t develop splits. 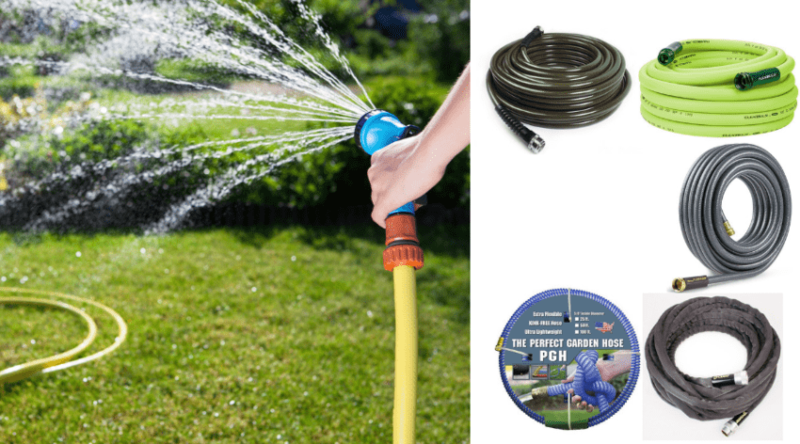 We’ve put together the best garden hose reel reviews so you can choose the right product for your garden. *You might also be interested in our garden hose reviews. One of the most important reasons for using a reel to stow away your garden tool is safety. Leaving the length unwound all across your garden and pathways can be a hazard and could lead to you or your family tripping over. The most popular garden tools like this are usually green and made of rubber. The green colour blends in with foliage and grass making it difficult to spot and even more likely you will slip over. The rubbery casing of it is very slippery so even if you have the hose laying flat on the ground and it isn’t a tripping hazard, it might well become a slipping hazard when wet. 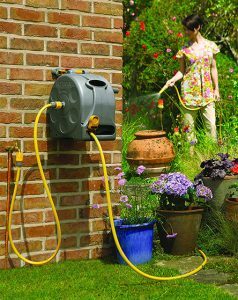 Using a high quality garden hose reel also means you will prevent the hose itself from becoming knotted or kinked. The most common way these tools break is through splits developing along the rubber when the tool itself becomes knotted or twisted. By using a reel, you can make sure it is wound back in neatly and stored properly. This will also increase the longevity of it, a garden hose will last five times longer if it is stored properly. Some reels actually house the hose within a protective casing so you are further protecting it from UV rays and adverse weather conditions including frost. A reel also stops it from leaking as it is tightly wound on the spool and stored away. You can see at a glance if the tap isn’t quite turned off which can save you money on your water bill. *Check out our reviews of garden host timers here. There are a lot of different types and models to choose from and that’s why it is always a good idea to look at garden hose reel reviews when choosing your product. The first thing to consider is the length of hose you need. Look at the size of your garden and then work out the furthest point from the outside tap or water source. You can save money in a larger garden if your water tap is in the middle or in a fairly central point as you won’t have to buy such a long one, but as most outside taps are on the wall of the main house, you need to measure the length of the garden up until that point. Durability is also key – with the hose as well as the reel. While you may end up paying a bit more for a more top rated garden hose, it will be worth it in the long run if you are to be using it daily because you won’t have to make repairs or even buy a new one when it runs out. There are lots of different types of material used to create garden tools including nylon, PVC, natural or synthetic rubbers and polyurethane. The key here is to think about when and how you will use it. If you are using your tool every day and the reel needs to be dragged across a rough surface like gravel or stone, then it would be worth investing in a hardwearing version. These reels also need to be durable as they are generally left outside, especially during the cold seasons. But you need it out there to maintain your garden during winter. There are models that are portable or fixed that completely encase the hose within a plastic structure – shielding it from the elements. On the other hand, if you are just getting your reel out from a shed or garage once a day and then stowing it back inside afterwards, you could get an open style reel. Portable or nonportable? There are several options for reels and it all comes down to usability. If you know you are going to need to transport your reel around with you, then choose a lightweight material like plastic with an easy grip handle. If you want a fixed model then look at how it attaches to the wall and make sure the wall you fit it on can handle the weight of the tool– believe it or not the reels are quite heavy once the hose is rolled up! 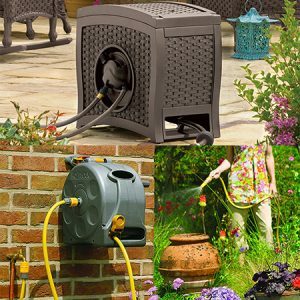 Retractable garden hose reels are also really useful if you have a long garden or just want to save on energy from reeling it in. These work by automatically pulling the length back onto the reel and rolling it up. They are quick and easy to use but sometimes do require some degree of strength to pull it out to begin with. Most reels come with a certain amount of accessories but the basic kits will just have the fittings to attach it to the water outlet. Think about investing in a nozzle for the end of your tool which can start and stop the water flow. 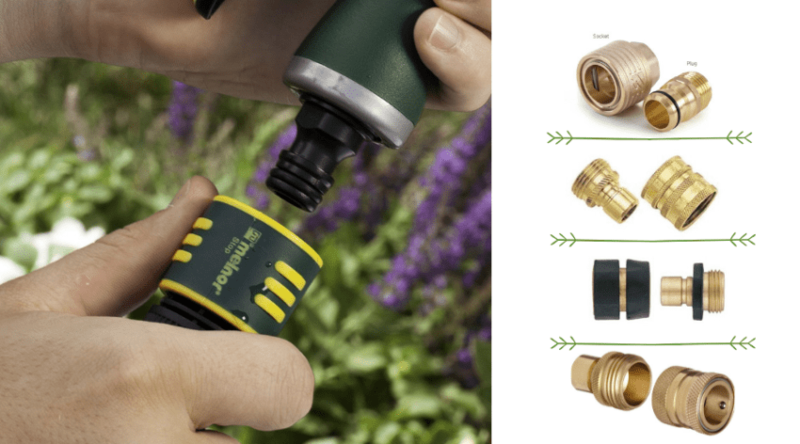 This is useful if you want to walk your tool out around the garden but then want to switch it off before you go back and turn off the water supply. Be careful not to leave water in your hose in frosty weather though, the water inside the tool may freeze and damage the garden tool. 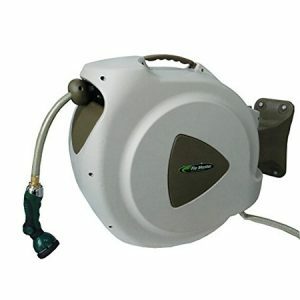 This stylish looking green and yellow hose reel comes with a 25metre hose supplied with a box full of fittings. It is made from high quality plastics and will be durable even if left outdoors. It comes with an easy rewind action which makes it quick and simple to rewind it back into the reel. The handy viewing window means you can keep track of it as it is reeled back in to prevent tangles. It is designed for quick and easy assembly and the carry handle means it is able to be carried around the garden as well as mounted to a wall if needed. 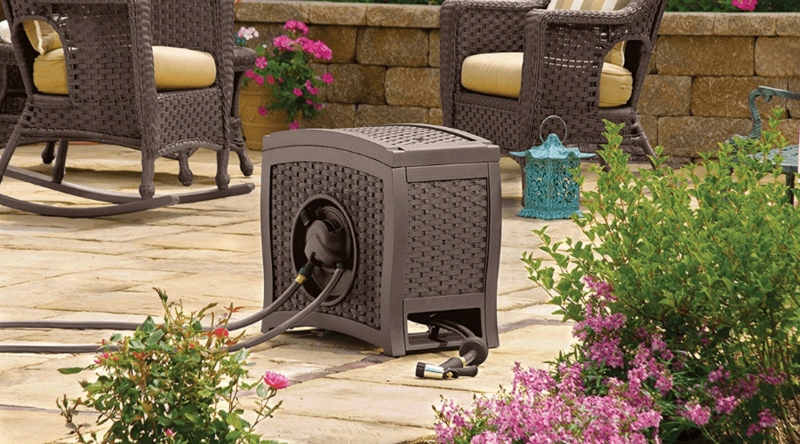 This hose reel is really part of your garden furniture so it makes a great option for those who have worked hard to design their outdoor space to look nice. Designed to fit in with your decor and design, the tool is stored out of sight. The tool itself is made of resin and the storage box is wicker. You can just flip a lever and it will rewind all the way back into the box making this perfect for gardeners with mobility issues. 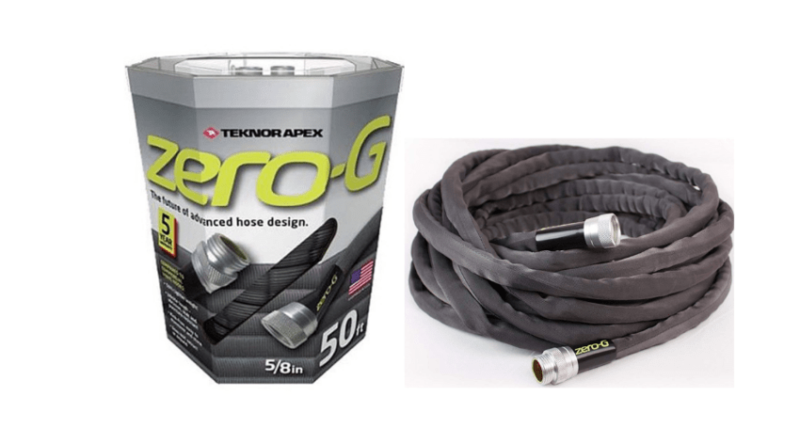 The standard hose is 125ft and a hose guide winds the hose evenly to avoid any snags or tangles inside the storage box. 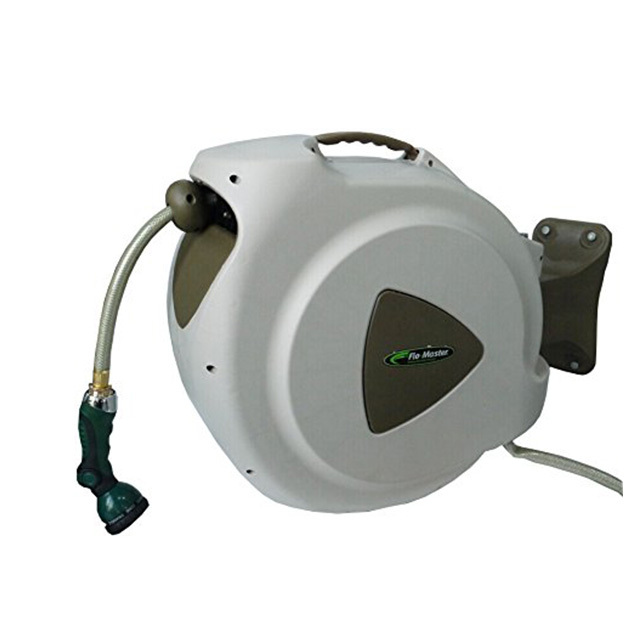 It comes fully assembled so you don’t need to worry about putting anything together, making this one of the best automatic garden hose reel products. There are also two garden stakes provided. 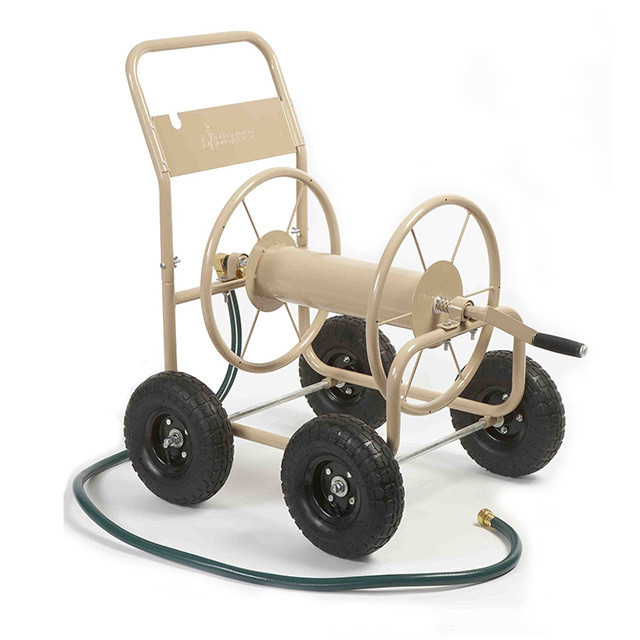 This industrial grade hose reel cart will make watering your garden fast and simple because it’s portable and can move with you as you work. The strong steel construction is durable and has a smooth reel that lets you pull out the tool to the length you need and then winds it back in smoothly, saving you the trouble of having to do it manually. The steel is powder coated for added protection against the elements and it can be used with a hose up to 300ft long. The cart is balanced so it won’t tip over and it is perfect for a commercial garden or larger grounds due to its massive reach and ease of use. But it would also be perfect for a smaller home that has multiple areas to water at different locations. 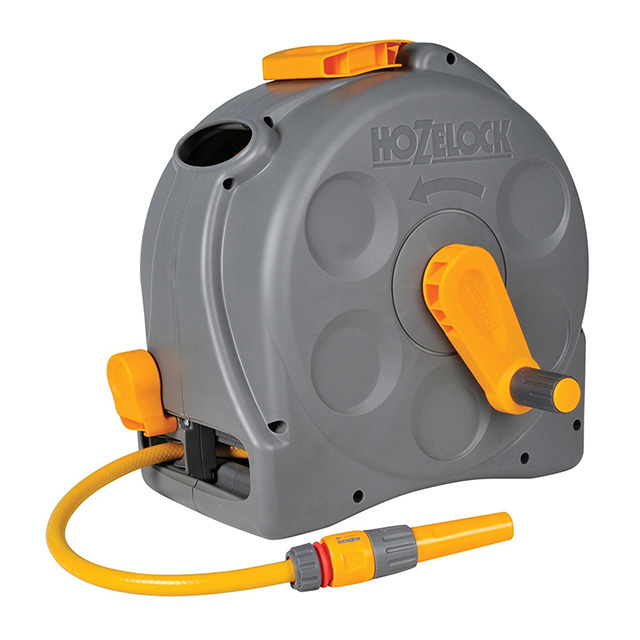 This hose reel comes with a 65foot braided hose which is reinforced for added durability and longevity. It has an eight pattern nozzle and a carry handle which makes this product not only multi-function, but also portable if need be. This unit can also be mounted to the wall with hardware and it can be removed for storage in the winter if you’d prefer to have it out of the way. It has a heavy duty spring which retracts the tool and a guide will stop the hose from getting tangled on the reel, saving you the trouble of having to wind it up by hand. The wall mount brackets allow the reel to swivel 180 degrees so you don’t have to fuss with moving or pointing it to where you’re going. 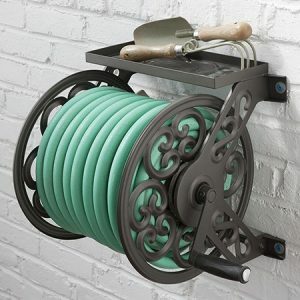 This stylish hose reel mounts to the wall to give your garden a traditional look. It has a convenient storage tray on top and brass fittings. It mounts to an outside wall but it does not include the fixtures and fittings required to fit. 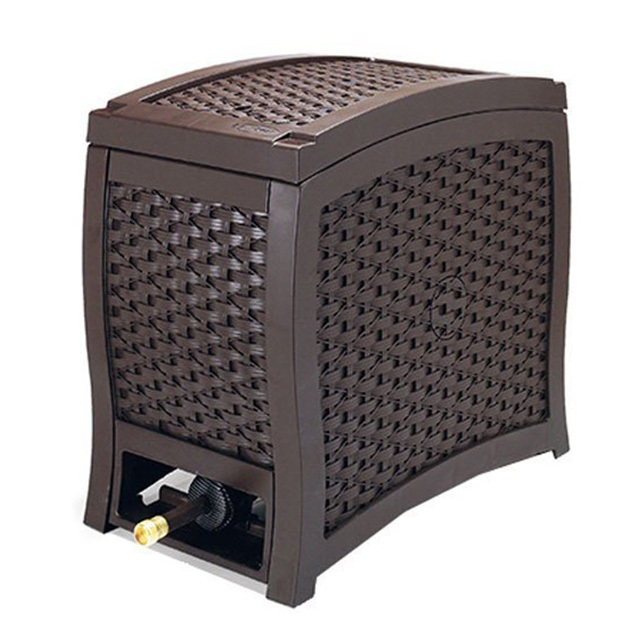 This model cannot be portable and must be fixed in a permanent place so be sure of the location you choose, aimf or one that is central to your garden and watering areas. It does not have a cover so the length itself will be exposed to UV rays and other adverse weather conditions, keep that in mind when mounting. You may want to choose a covered area or inside the garage/shed. 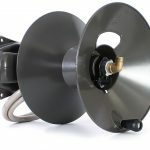 The hose reel has a solid brass swivel which prevents hoses becoming damaged from being pulled out at the wrong angle. In my opinion, the best rated product is the Eley Hose Reel. 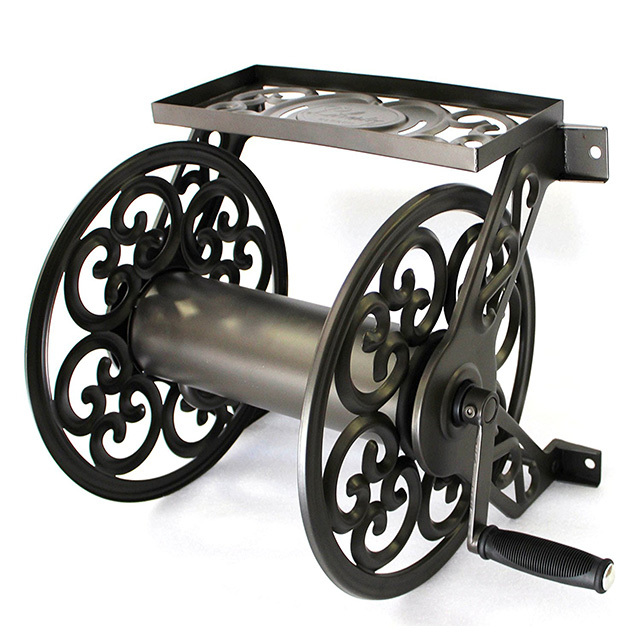 This reel is a wall mount but they also have wheeled carts, free standing or even post mount. Only the highest quality of materials are used in Eley hoses and there is a reason they dominate the hose reel and garden hose market. 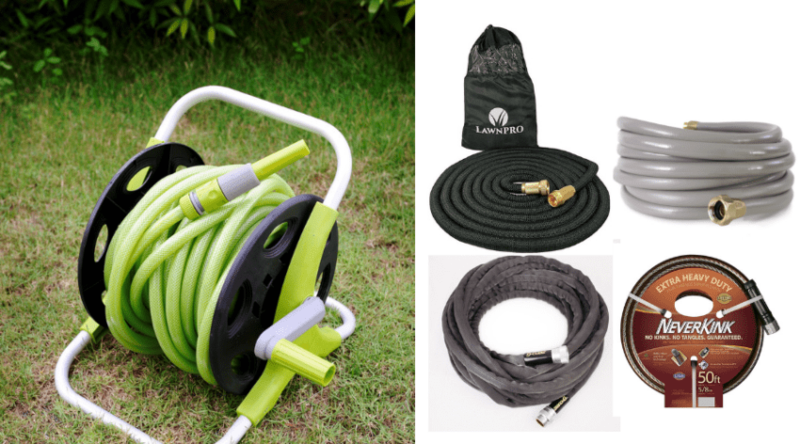 So, if you are looking for the best garden hose reel, then look no further!